The second-biggest of the Spanish Balearic Islands, Menorca is a beautiful and peaceful place to visit. 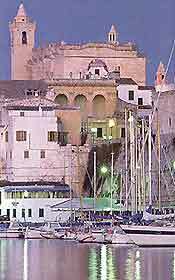 The island of Menorca tends to be quieter than both neighbouring Ibiza and Mallorca, yet still offers a superb array of attractions, historic towns and charming villages. Of course, one of the main highlights on Menorca are the endless stretches of sand, which provide the ultimate spot to top up your tan and enjoy a selection of water sports in the neighbouring Mediterranean Sea.